New Baha’i Prayer Beads Are In! Karen has just finished stringing several new styles of prayer beads – just in time for gift giving. Scroll down to see some of the new ones, or click here to see them all. With 21 different stones to choose from, there is something to fit every personality and every prayerful attitude. Sure you can say your Allah-u-Abhas without any prayer beads at all, but there is a reason why Baha’u’llah was called “The Blessed Beauty.” Beauty – particularly the beauty of creation – draws us closer to God. It is one of His virtues that can move us, even when we aren’t expecting it. Look at the pictures below. Doesn’t your heart give a little tug just looking at them? Imagine what it will do when you actually hold them… enjoy. Remember, we upgraded our website earlier this month. If you have to re-register from scratch, then you will receive a 10% off coupon to make up for the inconvenience. You are welcome. These are similar to our Fancy Jasper, (one of our most popular) but it adds dramatic splashes of deep blood red to the many shades of green. Perhaps they will inspire you to pray for the martyrs as well as yourself. 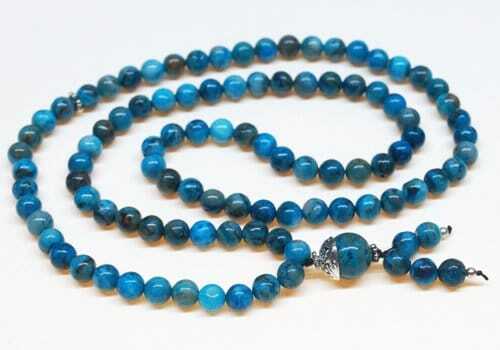 These beautiful blue beads have richer and more varied color than turquoise, and cost much less. I’m sure they will become a new favorite. 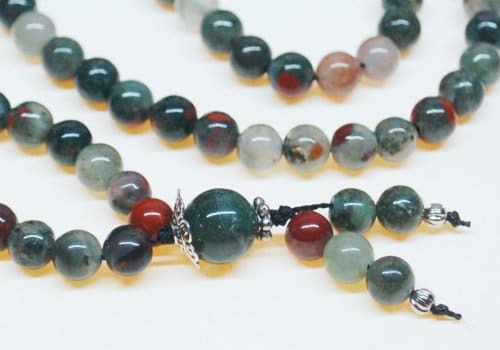 We string all of our Bahai Prayer Beads with 95 semi-precious stones plus 5 counter beads. We string the beads loosely so they pass easily between your fingers as you pray. The beads are 6mm round which makes the strand about 22-23″ inches in circumference. This allows them to double as a necklace for people who wear a small hat size. 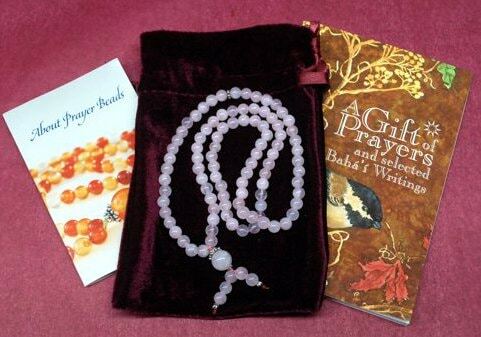 All Prayer Beads come with velvet pouch, prayer book and instructions. Each hand-crafted string of beads comes with a color-coordinated velvet pouch, a copy of A Gift of Prayers, and a fold-out instruction sheet with pronunciation guides, excerpts from the Kitab-i-Aqdas, helpful suggestions on how to use prayer beads, other short prayers that can be said repetitively, and interesting facts about prayer and meditation. 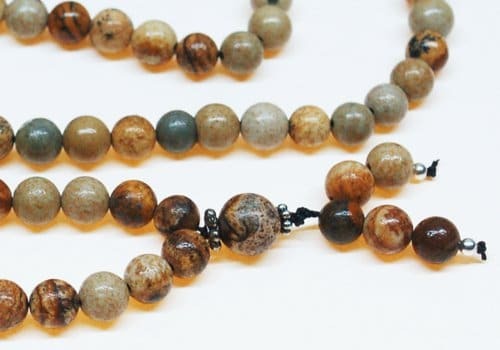 If someone has never used prayer beads before, it will get them started. Pictured here are our Rose Quartz beads on a wine colored velvet pouch. They aren’t new, but they are exquisite. 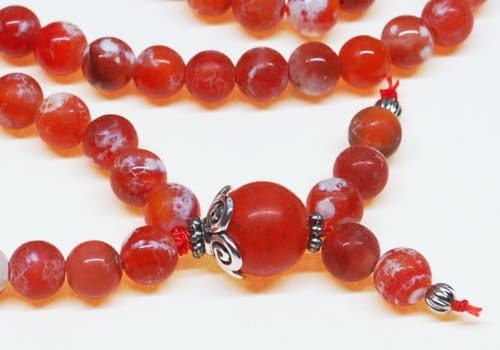 Perhaps our most dramatic prayer beads, these Fire Crackle Agate beads are fiery red-orange with distinctive white areas. They are perfect for people who feel passionate about their prayers. On the opposite end of the spectrum from the Fire Crackle Agate is the African Unikite. Its subtle moss green with rust-red and brown veins will connect you to your calm, stable and dependable side. Pictured is our Picture Jasper, an earthy stone with bands of contrasting earth tones running through it. We also have Fancy Jasper (one of my favorites), Red Creek Jasper, with splashes of red on an earth-tone base, and Leopard Skin Jasper, that is darker and more rusty colored, with more spots than stripes. They are all beautiful. I could go on for 12 more, but it would be easiest if you just click here and see them all.